It’s not uncommon for homeowners to add expansions and additional rooms on to their houses. It’s a popular and significant investment for adding living space to the home. And increased living space is what a lot of people are after. What many people overlook is the abundance of opportunities for increasing living space using smart, effective landscaping. With a bit of planning and some hard work, you can bring the indoors to your backyard and gain some beautiful new living spaces without building expensive new expansions to your home. There are some great new building materials out there that will allow you to convert your outdoor yard space into cozy, livable areas for the enjoyment of you, your family, and your guests. Take Unilock, for example. Unilock – the original interlock manufacturers who first brought the industry to North America in the early 70s – offers pavers and wall materials that make it easy to build outdoor sitting and walking areas that are beautiful, accessible, and easily customizable to suit your individual preferences. Unilock Has also built a massive display centre at their Georgetown location 287 Armstrong Ave, Halton Hills. This is a great place to go and get inspired, with all kinds of displays that will blow your mind. The addition of further outdoor features such as such as fireplaces and built-in outdoor BBQ grills allows for even more versatility with the space and gives you maximum enjoyment. 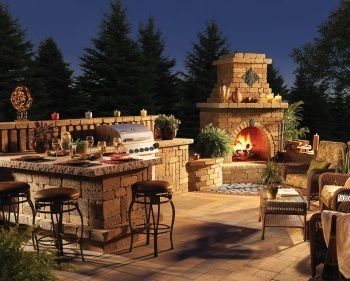 A pleasantly sculpted outdoor area with walls, windows, and a cheery gas fireplace could offer year-round enjoyment for you and your family. There’s a lot more to landscaping than simply changing the arrangement of your plants or greening your lawn. While it’s great to have a beautiful lawn, what people are really in the market for is useful space that they can take advantage of in their own way. That’s why we make a point of keeping up with the latest in material and design. We make sure we know how to install and build the kinds of spaces that homeowners can cherish for years to come.